Every day I get up and vow not to write about politics, but the world is growing increasingly mad, so I’m left with no choice, but to either internalize it all, or say something. So, why is it that people see the madness everywhere, but do nothing about it? Jesus said “When tribulation comes, people will go about their business, just as in the days of Noah.” In other words, as the signs of impending disaster were everywhere, people ignored the evidence of their eyes and ears, and continued buying and selling, indifferent to the world around them. I’m not referring to “The Great Tribulation,” as it’s now understood, in some Christians circles. Jesus was referring to what the Gospel writers understood as the destruction of the 2nd Temple of Solomon—and with it, the destruction of Israel for a 2nd time, leading to the Jews being driven from Jerusalem for nearly 2000 years. This wasn't an end of the world prophecy, but it was the end of Israel’s world, as they knew it. The important thing to remember, is the Gospel writers were looking back on events, not forward—and, in the light of those events, Jesus’ teaching and its meaning, became clearer. It essentially took about 40 years for Jesus’ students to fully grasp his intent, but only as events unfolded around them. Jesus’ students watched as the Jews became increasingly antagonistic towards their Roman occupiers, just as they had with the Babylonians, some 600 years earlier. These are pivotal events in the life of the Jews and the History of Israel, written about in the bible, and they are key in grasping the bible’s meaning. What Jesus was referring to, was a second apocalypse for the Jewish people. 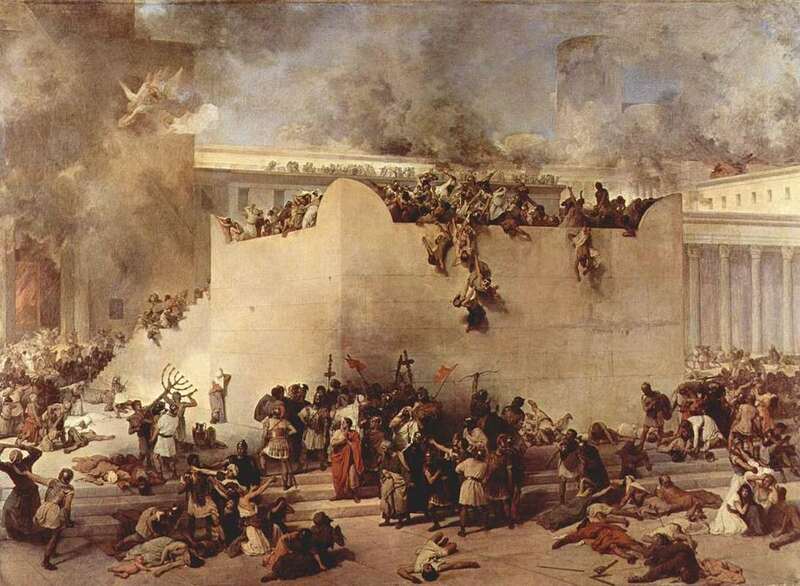 The first being the destruction of Solomon’s original temple in 587 BC. Without the temple, which provided a means for sacrifice, there could be no sacrifice for sin, leaving people to die in their sin. That is the general biblical language, and way in which most, but not all Jews, understood sin and atonement in biblical times. Here are the keys; Jesus warns Israel that moving towards war with the Romans, will lead to their complete destruction, so he offers the way of peace, instead. Not war, but peace, through love, and passive resistance, thereby winning the Romans over to the way of Christ. Which, remarkably, comes to pass, three centuries later, leading to the beginning of the Christianization of much of the world. Imperfectly, mind you, but generally, for the better. That is what the trial of Jesus represented. It was also the choice offered by Pontius Pilate. Even a corrupt man like the Roman governor Pilate, could see that Jesus was innocent of the charge of treason. To choose Barabbas, then, was to choose war and violence. If they chose Jesus, they chose the path of peaceful resistance. This was the way the biblical writers interpreted these events. When the predominately Jewish people chose Barabbas, their fate was sealed. I’m not talking about literalism here, but the bible’s preferred method, which is symbolism. For instance, John The Baptist was not really Elijah, as Jesus said, but an archetype of Elijah. The Jews believed that Elijah would return, before the Messiah. And, he did. Not literally, but symbolically. John served the same function as Elijah; he spoke out against the King of Israel’s corruption, just as Elijah had, nearly a thousand years before. Both john and Elijah, warned of the inevitable destruction of Israel. Each, in their respective times, if the people of Israel did not repent. As the result, Jesus is willingly put to death for the sins of Israel, and by extension, the sins of the world. This eventually lead to a bloody, protracted, suicidal war between Rome—the greatest power of the age—and the Jewish people, forty years after Jesus’ death. This is not, I believe, prophecy regarding the nature of all war or peace, but is highly specific to the circumstances of the Jews at the time, and in history. All of these things can be verified, not by supernatural methods, but by looking at actual history. Let me stress, however, the exact historicity of these events, is less in important, than their meaning. Exacting histories are a function of the modern world, not the ancient world. Why am I saying this? “For those who have an ear to hear.” To borrow the biblical vernacular. I’m not talking about traditional religious perspectives, that is a different debate. The same patterns in history emerge, time and again. Because human beings are human, and therefore predictable. At least, in some broad sense. ​The signs are everywhere, if you can read them. Again, this is not some supernatural revelation, anymore than the bible’s history, is primarily supernatural, it isn't. It is simply observable, and it is history—and those who are ignorant of history, are doomed to repeat it.